I’m guessing that most of you who read my blog also read Susan’s blog. But in case you don’t, you might have missed the fact that Susan and I have started a Yahoo Group together. The Lonesome Skein Knitalong is designed to help you use up those solitary skeins of yarn you have hanging. We are suggesting that you use them to make quick and easy projects for holiday and charity giving. There are links for patterns and the emails and introductions are flowing. You can read all about the group by clicking on the picture up there but you need to hurry because sign ups close on October 16th. Very cute. I reckon I’ll just mosey on over and enlist, er, sign up. Sounds great to me. I’ve signed up! I don’t do Christmas Knitting and rarely do small projects. But it’s a GREAT idea! Yay! I already joined. 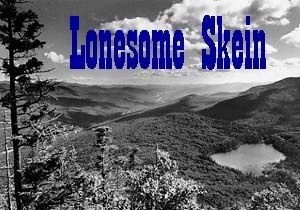 I have so many lonesome skeins, balls, hanks, the works! Thanks for making this group! You got me – just signed up! Can’t wait to create a little wiggle room in my stash before Rhinebeck! What a good idea! What charities are you suggesting people donate to? I’m in…thanks for the heads up. Great idea! Already there, and this is turning into a great resource for patterns – aren’t you two the clever ones?! Thanks for putting this together. You’re cracking me up with the Lonesome Skein. Love that graphic! I just went and signed up. Now, we’ll just see if I make it through the screening process……….sounds like a good idea! Hey, that picture looks like it came from my house (although they are probably too many trees for it to actually be my house). Great idea. I’m going to have to think about this one. Okay not like I have any leftover skeins of yarn…LOL…I can’t wait to check this out! I’ve got skeins. I need gifts. Count me in. Oh, what a good idea! I’ll just sit here and admire all your clever ideas as I’m on a KAL moratorium until I actually K, you know, AL and not eons after the fact. Great idea! I’ve just signed up. I hope I can put in as much as I expect to get out of it! I’m in! I’ve got lots of them pesky single skeins hangin’ around. And I’m feeling motivated. And I need some fingerless mitts. Thank you! ionolsen25 I just don not have anything to say right now. ionolsen25 Great website! Bookmarked! I am impressed at your work!